Reduces chlorine taste and odor, fluoride, chromium, lead, nitrate, barium, cadmium, 98% of dissolved minerals, salts and other chemical contaminants in potable water supplies. 50 Gallons of purified water per day. Requires no tools for maintenance. 100% coconut based NSF certified carbon filter cartridges. 3.2 Gallon storage tank, brushed nickel faucet, self piercing drain saddle valve, water supply adapter, color coded instructions, tubing and other installation accessories included. E31L-12W-S5 Sediment 5 Micron Depth Filter for particlulate removal (dirt, sediment, rust particles and other particulates). E31L 12W-C Granular Coconut Shell Carbon Filter with 12x40 mesh size for chlorine taste and odor removal. E31L-12W-CTO-5 Coconut Shell 5 Micron Carbon Block Filter for chlorine taste and odor, VOC removal. PT-1812-50 PureT Reverse Osmosis Membrane for reduction of dissolved solids, fluoride, barium, cadmium, lead, chromium, nitrate and other chemical contaminants in potable water. IL-10W-C-EZ Inline Granulated Coconut Shell Carbon Polishing Filter for taste improvement. Innovative EZ Twist-On connection design allows filter cartridge changes in just 3 seconds. 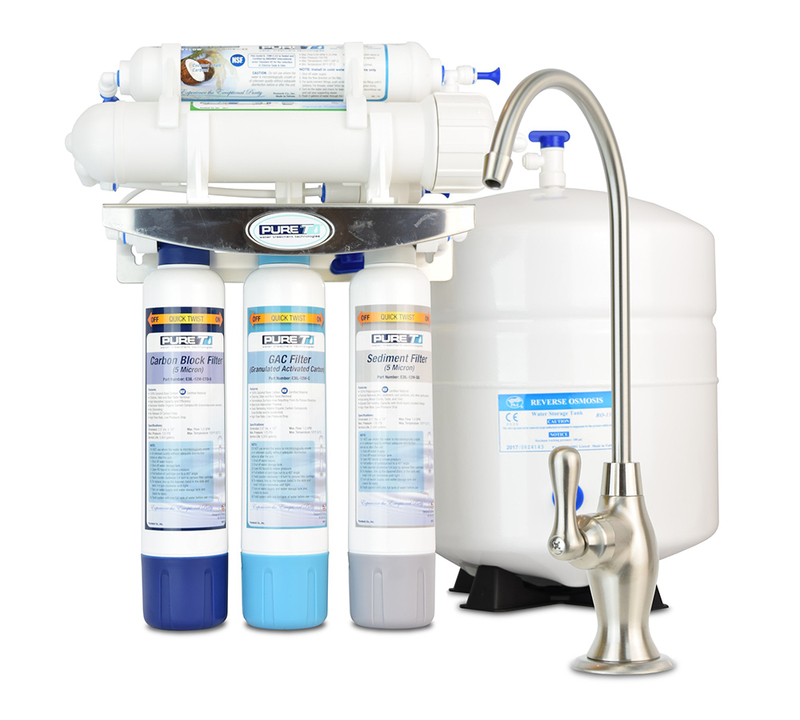 WECO is proud to present the PureT branded EZ Slim 5 stage reverse osmosis filtration system. EZ Slim is the ideal water purification filter for home, office, health clubs, juice bars, coffee shops or anywhere safe, fresh-tasting water is needed. The PureT reverse osmosis system uses separate individual stages of water filtration to create pure, refreshing drinking water. The process starts by pre-filtering the water through a sediment particulate filter. Prefiltration removes tiny particles that can get into the water supply. These include iron oxide (rust), silt, sand grains and insect parts. This filtering stage protects your family from drinking sediment and prevents the filtration system from clogging. At the 2nd stage, a granilar activated carbon filter cartridge filters chlorine taste and odor. Next, water flows through an activated carbon block cartridge. This compressed activated carbon block filter removes taste and odor-causing chemicals like chlorine, chloramine and rotten-egg (hydrogen sulfide) and musty odors. The chlorine disinfection process is known to create cancer-causing byproducts in the water. These carcinogens, called THMs, are removed by the activated carbon block filter. The carbon cartridge also removes organic contaminants like herbicides, insecticides and industrial chemicals that seep into groundwater. But that’s not all. The next filtration stage involves the reverse osmosis (RO) process. Tap water is “squeezed” through a special Thin Film Composite (TFC) semi-permeable membrane. Heavy metals, like lead, cadmium and mercury, are removed while purified water passes through. The RO process also removes salts, nitrate, fluoride, radon and benzene. 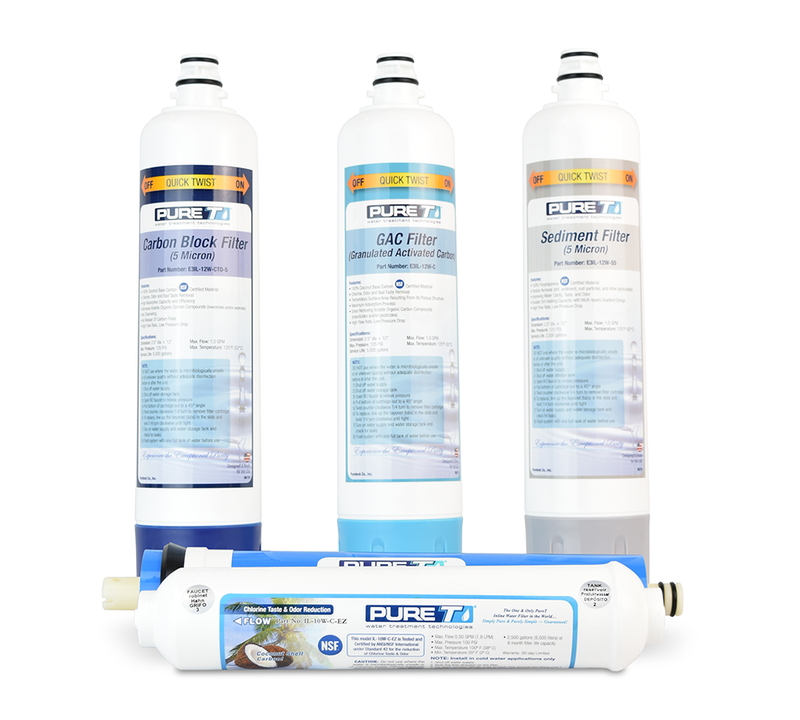 The reverse osmosis membrane is NSF-certified and features outstanding efficiency. Other reverse osmosis filters can waste up to 10 gallons of water for every gallon of pure water made. Just like our own WECO RO systems, the PureT EZ Slim high-performance RO membrane produces only four gallon of waste water for each gallon of purified water. This saves you money, reduces waste water, conserves resources and helps the environment. For the final stage of purification the water flows through granular activated carbon (GAC) in-line post filter. This acts as a polishing filter, removing any traces of tastes, odors or gasses, for crystal clear, sparkling drinking water.